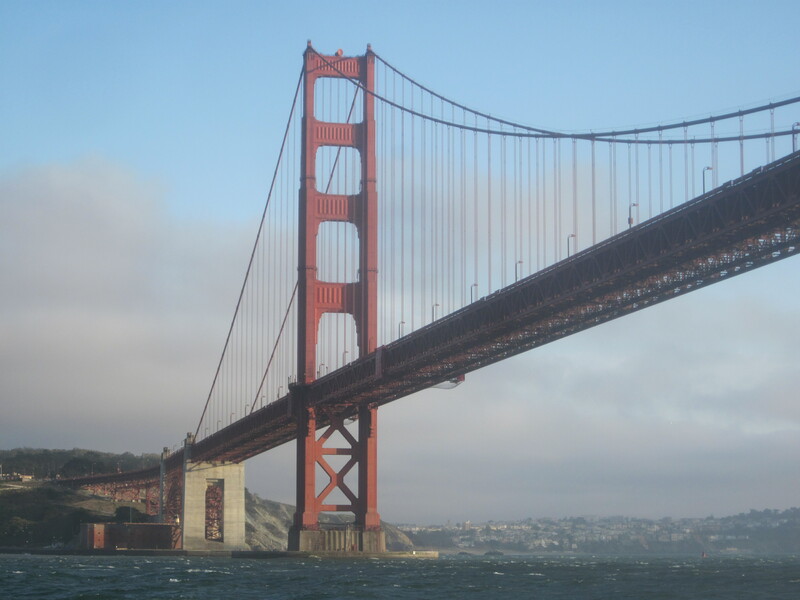 Weather Data from the Bridge: Northwest wind 15-25 knots, wind waves 3’-5’, northwest swell 4’ – 6’ at eight seconds, overcast. UC Davis graduate student and Point Blue Conservation Science intern Kate Davis took some plankton we collected to the Bodega Marine lab in Bodega Bay. She said she is seeing “tropical” species of plankton. A fellow graduate student who is from Brazil peeked into the microscope and said the plankton looked like what she sees at home in Brazil. The flying fish we saw is also anomalous, as is the number of molas (ocean sunfish) we are seeing. Plankton can’t swim, so some of our water must have come from a warm place south or west of us. The surface water is several degrees warmer than it normally is this time of year. 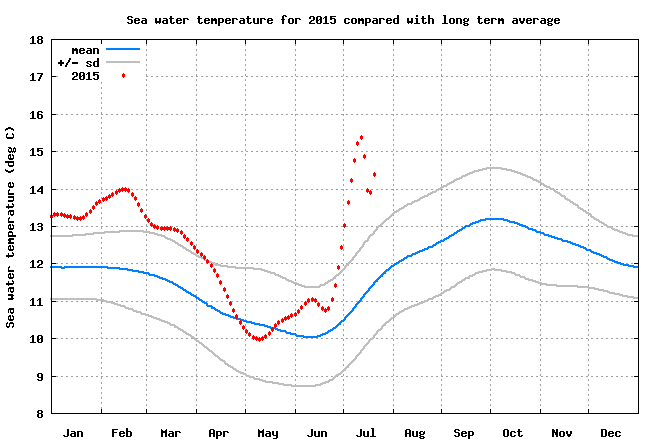 NOAA maintains a weather buoy near Bodega Bay, California that shows this really dramatically. Click on this link – it shows the average temperature in blue, one standard deviation in gray (that represents a “normal” variation in temperatures) and the actual daily temperature in red. As you can see, the daily temperatures were warm last winter and basically normal in the spring. Then in late June they shot up several degrees, in a few days and have stayed there throughout this month. El Niño? Climate change? The scientists I am with say it’s complicated, but at least part of what is going on is due to El Niño. My students from last year know that the trade winds normally push the surface waters of the world’s tropical oceans downwind. In the Pacific, that means towards Asia. Water wells up from the depths to take its place on the west coasts of the continents, which means that places like Peru have cold water, lots of fog, and good fishing. 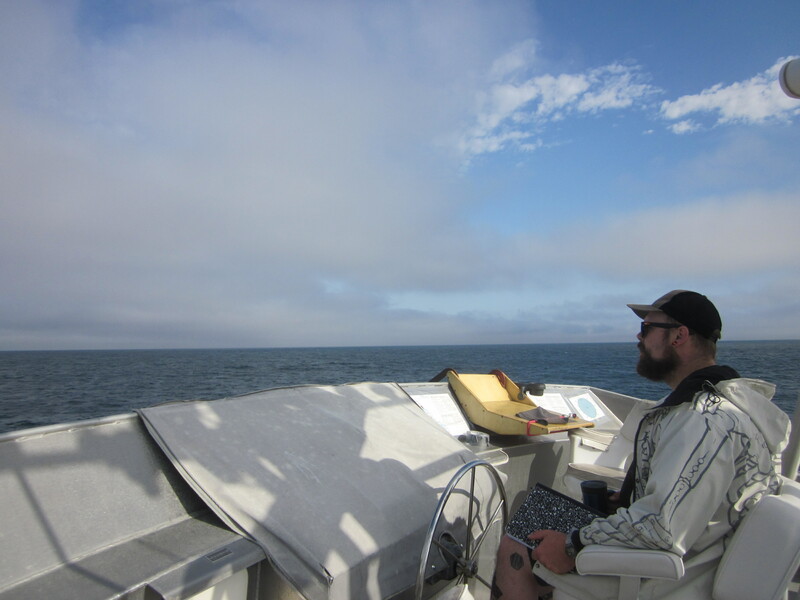 The fishing is good because that deep water has lots of nutrients for phytoplankton growth like nitrate and phosphate (fertilizer, basically) and when it hits the sunlight lots of plankton grow. Zooplankton eat the phytoplankton; fish eat the zooplankton, big fish eat little fish and so on. During an El Niño event, the trade winds off the coast of Peru start to weaken and that surface water bounces back towards South America. This is called a Kelvin wave. Instead of flowing towards Asia, the surface water in the ocean sits there in the sunlight and it gets warmer. There must be some sort of feedback mechanism that keeps the trade winds weak, but the truth is that nobody really understands how El Niño gets started. We just know the signs, which are (1) trade winds in the South Pacific get weak (2) surface water temperatures in the eastern tropical pacific rise, (3) the eastern Pacific Ocean and its associated lands get wet and rainy, (4) the western Pacific and places like Australia, Indonesia, and the Indian Ocean get sunny and dry. This happens every two to seven years, but most of the time the effect is weak. The last time we had a really strong El Niño was 1997-1998, which is when our current cohort of high school seniors was born. That year it rained 100 inches in my yard, and averaged over an inch a day in February! So, even though California is not in the tropics we feel its effects too. We are in an El Niño event now and NOAA is currently forecasting an excellent chance of a very strong El Niño this winter. 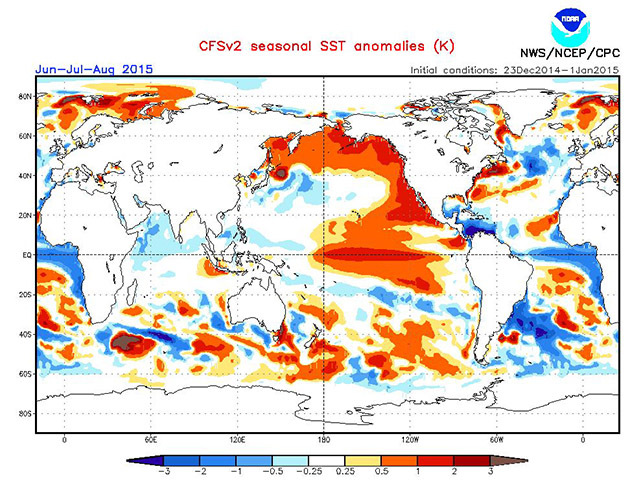 Sea surface temperature anomalies Summer 2015. Expect more red this winter. What about climate change and global warming? How is that related to El Niño? There is no consensus on that; we’ve always had El Niño events and we’ll continue to have them in a warmer world but it is possible they might be stronger or more frequent. So, is El Niño a good thing? That’s not a useful question. It’s a part of our climate. It does make life hard for the seabirds and whales because that layer of warm water at the surface separates the nutrients like nitrate and phosphate, which are down deep, from the sunlight. Fewer phytoplankton grow, fewer zooplankton eat them, there’s less krill and fish for the birds and whales to eat. However, it might help us out on land. California’s drought, which has lasted for several years now, may end this winter if the 2015 El Niño is as strong as expected. Did You Know? El Niño means “the boy” in Spanish. It refers to the Christ child; the first signs of El Niño usually become evident in Peru around Christmas, which is summer in the southern hemisphere. The Spanish in colonial times were very fond of naming things after religious holidays. You can see that in our local place names. 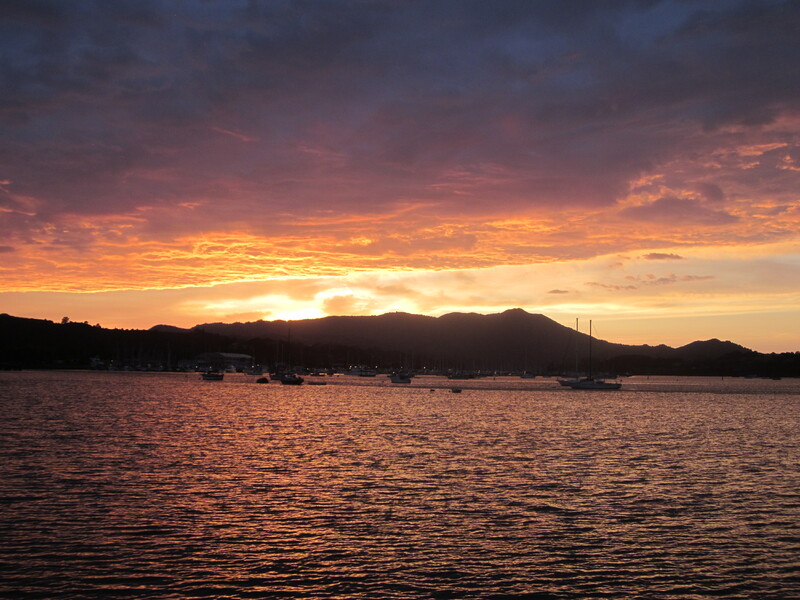 For instance, Marin County’s Point Reyes is named after the Feast of the Three Kings, an ecclesiastical holy day that coincided with its discovery by the Spanish. There are many other examples, from Año Nuevo on the San Mateo County coast to Easter Island in Chile. 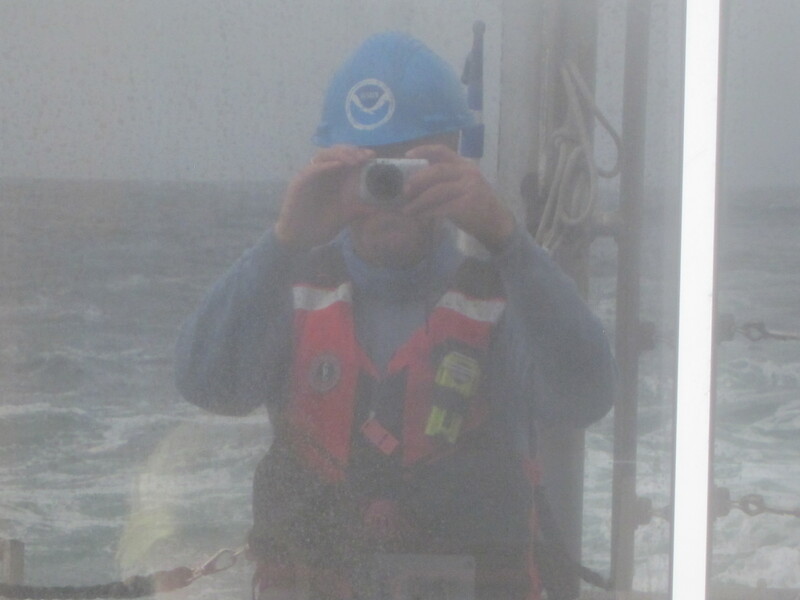 This entry was posted in 2015, Michael Wing, National Marine Sanctuary, NOAA Teacher at Sea, NOAA Weather Service and tagged el nino, NOAA Teacher at Sea, plankton, zooplankton. Bookmark the permalink. I just don’t fully understand why El Nino produces so much more rain. I get that the surface temperature increases, but does that somehow change the pattern of the weather systems? I was reading on a website, and it said that El Nino doesn’t so much increase the amount of weather, more change the patters so that weather hits parts of the country usually left unexposed to large weather systems. Just still a little bit curious on the subject. could the flying fish from a few days ago also be connected with the warming waters? Yes, absolutely. Nobody has seen a flying fish here for at least ten years. I heard on the radio that Monterey Bay has recently turned a lighter color. A popular theory is that it’s because of coccolithophores, a single-celled phytoplankton. Have you heard about this from your fellow “boat-mates”? Have you seen it spread to where you are? Any theories? I never knew how much El Niño affected animals, I always thought it was just a bunch of rain. Hopefully they are right and California will be pulled out of this awful drought this summer! I’ve really missed big rain storms. Your trip is very interesting, and it’s cool that it has so much to do with what we studied last year. 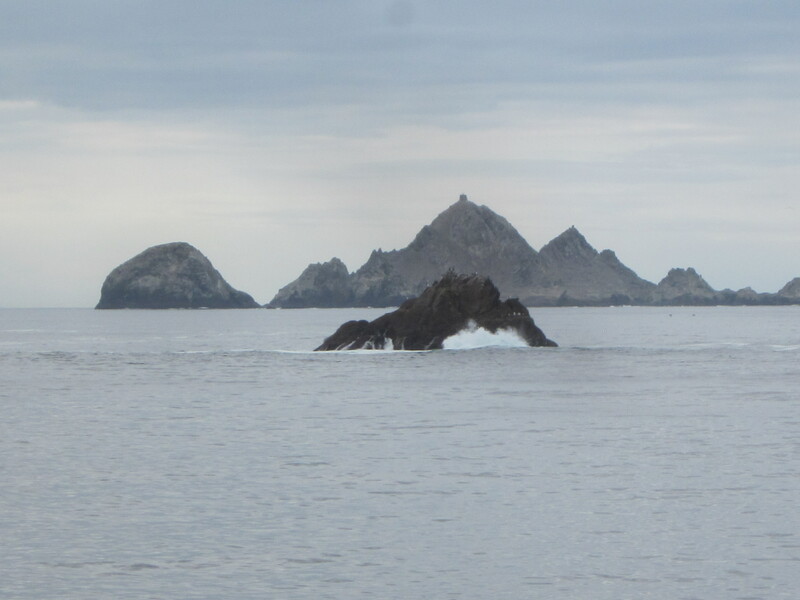 You said that “The Farallon Islands are warmer this year.” I was driving to Limantour, and I noticed that I could see the Farallon Islands very clearly. This could have just been my position, or the non-haziness of the day, but I wonder if the extra heat could have made them easier to see than usual? Do you think that El Niño will in fact have a great effect on the weather this year, and push California (or help to push it) out of the drought? Or do you think that, as it has happened before, that we are wrong that this is a strong El Niño? The time stamp of my last post is incorrect. Although it says July 27, it is really the 26th. I’m sorry to cause confusion.